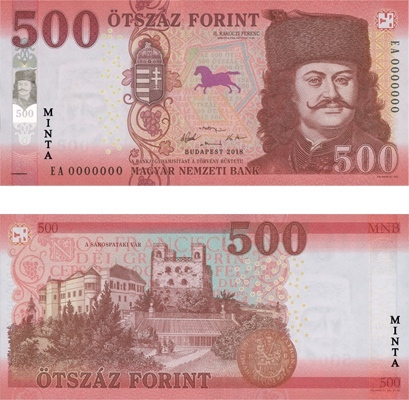 Hungary’s central bank, the Magyar Nemzeti Bank, has begun circulating the 500-forint banknote – the last denomination in the banknote series to be upgraded. The central bank first announced the issuance of the 500-forint banknote last July. Image courtesy of the Magyar Nemzeti Bank. Key security features include a holographic foil stripe shown on the front of the banknote, as per all the latest denominations of the Hungary banknote series. Optically variable ink is used to display an image of a horse, also on the front of the note, which changes colour from purple to green as the banknote is tilted. Other features include a watermark, embedded security thread, see-through register pattern, iridescent ink, latent image, microtext, ultraviolet (UV) features, and tactile intaglio print features including a single horizontal line printed at the lower left hand side of the note’s front – aimed at those with visual impairments to identify the note’s denomination. 1,000-forint note, circulated in 2018. Read more about the upgraded banknotes at the central bank’s website.